When leaving rented accommodations you have to not only think about managing the specs of the actual removal, not to mention figuring out a new place to stay at, but also you have to take care of your end of lease cleaning duties. Proper cleaning might be the guarantee for the return of your rental deposit. At Rabbit Man and Van we do not want you to miss the opportunity to fill your budget with some extra cash, especially when it is yours – so we have tailored the most reliable and cost-efficient end of tenancy cleaning London covering service. Count on our expertise as an established man with a van firm in London and you are not going to regret it. No matter whether you are leaving a one-bedroom apartment or a huge house, we are certain we are going to finish the job in a timely fashion and up to the most desirable results. Despite the fact that our London end of lease cleaning service is usually used by people who are renting accommodations, it would be very suitable for you in those cases that you are vacating premises that you already own and moving to another place. No matter what you intend to do with the property – lease it, sell it or leave it unoccupied for the time-being, it will be very useful to have a team of expert cleaners move through it and give it a more presentable look. Among other things, our London covering moving out cleaning service is a hundred percent environmentally responsible one. What does that mean? Simply that most of our state of the art equipment utilises the power of steam, and no dangerous chemical based products are used when treating stains, dirt and soil on the property. We employ methods that reduce both carbon emissions and the waste of valuable resources like water. For an end of tenancy cleaning service that is also good to the planet, just call us. 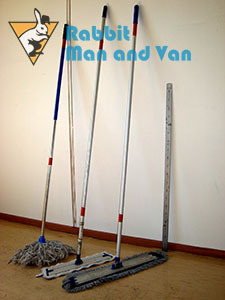 As we have already mentioned above, at Rabbit Man and Van London we do moving out cleaning on some of the best prices available on the market as of today. Call now and find out exactly how much you will be charged for the full service. You can arrange a viewing to be done with our customer support if there is something more specific in the cleaning project to be considered and a better assessment is needed. We can be reached around the clock over the phone and via email as well. London is a great place to live and work. The thriving commercial districts in the City and Canary Wharf have created and sustain probably the greatest economy in the world. The cultural life in the capital is famous around the world, and so are some of the notable tourist attractions here- The Eye, Westminster Abbey, Buckingham Palace etc. Many people say that the North London districts, e.g. those that lie to the north of the River Thames, are better in terms of living conditions. After all, historically, the first modern suburbs, the Tube network and many other amenities originated here. Today the South however is quickly catching up. Places like Croydon enjoy economic prosperity and good transport links that make them very attractive indeed.